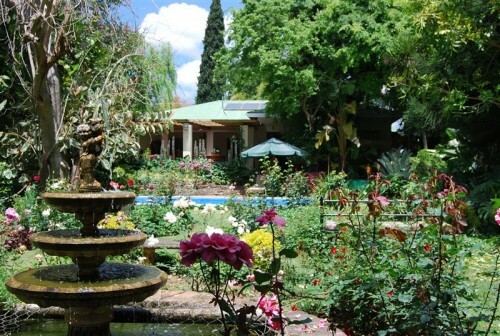 Cleveland B&B: Experience the tranquility of evergreen, lush gardens, where the freshness of the swimming pool invites you to cool down at sunset. Stroll through the adjacent citrus orchards and smell the uniqueness of citrus blossoms on the morning breeze. Enjoy hospitality in true farm style tradition without the noise of traffic and people. Visit Cleveland Guest House; a working citrus farm country house, situated on the banks of the Sundays River Valley, in the heart of the Greater Addo Route.Let us take you on an educational tour with our antique tractor. Witness how citrus fruit is harvested in season and visit a nearby pack house to see the finished product. We are within a short distance of exciting 4×4 routes, canoe rides on the river, the Addo Elephant National Park, the local cheetah breeding farm, as well as walking trails next to the river where abundant birdlife can be viewed. Airport transfers can be arranged upon request as well as guided tours in the Addo Elephant National Park, helicopter rides, historical tours and Valley Garden tours. Michael Marshall, South Africa: Brilliant accommodation with friendly and efficient service. Would recommend to everyone looking for accommodation in Kirkwood.